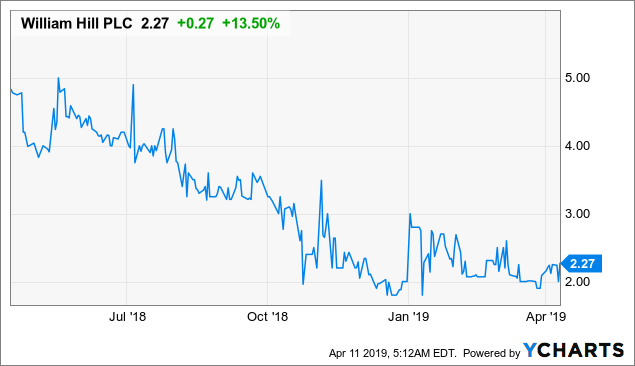 William Hill: Bet On The Expansion In The U.S.
William Hill share price under pressure in the past 12 months coming from UK regulation. US sports betting market presents a unique opportunity. William Hill is in a good position to seize the opportunity. Attractive dividend commitment is another positive for William Hill. William Hill Plc (OTCPK:WIMHF) is a British betting company founded in 1934. William Hill shares lost more than 50% over the past 12 months as a result of gaming regulations in the United Kingdom. The UK retail market has matured with a low growth rate and will be impacted again by regulation in 2019. That makes online betting and US expansion the key factors in the future success of William Hill. I see William Hill at the current price as a good opportunity to profit on successful US expansion in the next 5 years. Furthermore, William Hill is offering a nice dividend yield with a minimum dividend commitment from the company. In May 2018, the UK government as an outcome of "Triennial review" decided to impose new regulation on the gambling industry. The maximum stake limit on gaming machines at betting shops was decreased to £2 from £100 and comes to effect in April 2019. This decision impacts the business of William Hill heavily. The regulation decision led to the non-cash £883 million impairment of Retail estate (fully reflected in 2018 Financials). Moreover, William Hill expects to close around 900 betting shops out of approximately 2300 it runs in the UK. It also expects a decrease in operating profit in the range of £70-£100 million annually. On 14th May, the Supreme Court overturned the Professional and Amateur Sports Protection Act (PASPA) and made sports betting legal in the United States. The availability of sports betting now depends on individual states and their regulation. Seven states already introduced a regulatory and legislative framework for sports betting in 2018. Another twenty states should follow in the next three years. 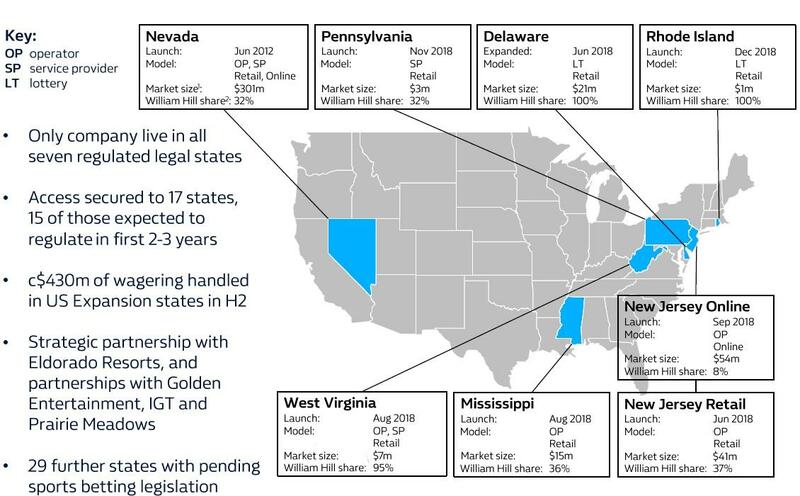 The size of the US sports betting market could be somewhere in the range of $5 to $19 billion annually depending on the regulation adopted by individual states (Source: William Hill Capital Market Day Presentation). William Hill is already active in six states and has access to a further 17 states thanks to the cooperating agreement with Eldorado Resorts (ERI). Thanks to its early work on access to individual states, I expect that William Hill will reach at least 32% market share on average, the same it has in Nevada (Nevada has a long history of legalized sports betting). William Hill expects that the US will contribute up to 40% to revenues in 5 years. William Hill pays out 50% of operating profit (until 2018 excluding US expansion costs, from 2019 including the US expansion). In expectation of higher US expansion costs, William Hill decided to underpin the dividend at 8p (£0.08). That gives a solid 5% dividend yield at the current share price. The never-ending saga of Brexit makes any investment into the British company less attractive. However, the material impact of Brexit should be small on William Hill's business. William Hill's operations in the UK are run from London and Gibraltar (UK territory), the international online operations are run from Malta (European Union) and the US existing business and expansion are managed by William Hill US company seated in Las Vegas. This division in operations makes William Hill prepared for any possible Brexit scenario (agreement or "no-deal" Brexit) and impact on financial results should be neglectable. I see William Hill as a good opportunity to bet on successful US expansion. I think that revenues from the US outperform the losses caused by UK regulation in the next five years. The potential of the US sports betting market is enormous and William Hill is in a good starting position. The ambitious goal to double the operating profit and change the revenue mix can be reached in 2023. The current low share price and a 5% dividend yield (underpinned by the company) makes William Hill an attractive investment opportunity with a big upside potential.